Body is 3 1/2 in. Tall, with legs 7 1/2 in. Tall. 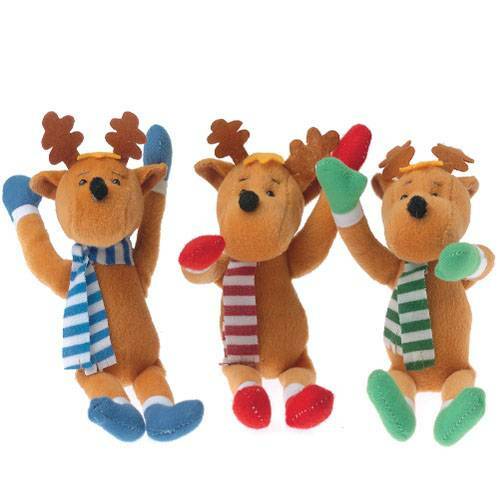 These stuffed animal Moose are keeping warm this winter season with scarves, boots and mittens. The inexpensive price makes these stuffed animal toys the perfect party favor or parting gift for holiday events or to use as stocking stuffers. Want ideas for inexpensive stocking stuffers or party favors? Then look no further than these plush Winter Moose. Check out our other Christmas novelties and favors for economic gifts and more! Stock up on all your Christmas supplies with US Toy.